The airline industry is one of the most regulated industries in the world and therefore serious challenges are entailed when trying to meet regulatory requirements such as those imposed by EASA. The provision of high quality training is a challenging task. In addition, the development of training programmes that meet all training requirements whilst also being cost-effective is not easy. DENTO offers both distant and on facilities Theoretical Training. Partnered with industry leading Aviation Courseware manufacturers, DENTO provides approved Web Based Training (WBT) for distant training as well as Computer Based Training (CBT) in Cyprus, London and Dubai. 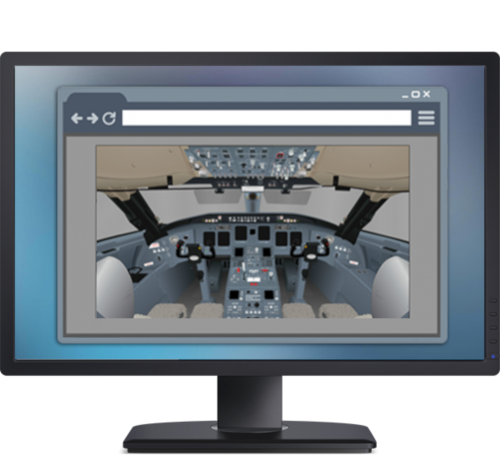 Our eLearning Programs provide training that is standardised and in line with the current EASA requirements. Our online modules are cost effective because they can be delivered to students all around the globe without the need for instructors or training facilities. They can also be updated much faster and allow students to study at their own pace at any time and from anywhere they want. Additionally, classroom training is also conducted for certain courses and/or when requested. Before any exams are taken, Dento’s instructors are there to conduct course reviews, answer questions and clarify whatever is needed. Associating ourselves with various simulator centres all around the world, therefore bringing practical training and examination closer to your own home. Providing in-house facilities such as our own classrooms, training tools/devices, our own Flight Training Device, etc. Utilising Instructors and Examiners that are in current flight operation and who have a fresh and thorough understanding of the current aviation industry.